A trip to North Eastern part of the country was always relegated to next year due to some or the other reason. And then a trip to Kaziranga National Reserve along with a short two day halt at Shillong for shopping, eating and visiting friends came to fruition suddenly. However, the whole group of seven states “The Seven Sisters” still eludes us…..
We reached Shillong at around six thirty in evening and headed straight to the Air Force Station Holiday Cottage. It was a cold January evening with temperature dipping to 4 degrees. A flaming fireplace converted the room to a perfect cozy retreat and a little Brandy, the liquid fire, helped in spreading comfortable warmth within to fight the biting chill all around. The cottage overlooked a lake and I couldn’t have asked for a better place to spend two days in. Bliss…. With our friends having left the town due to some family emergency, we had ample time and nothing much to do. As we sat nursing our drinks at the bar that evening, we admired the various photographs of the local flora and fauna that adorned the bar room walls. 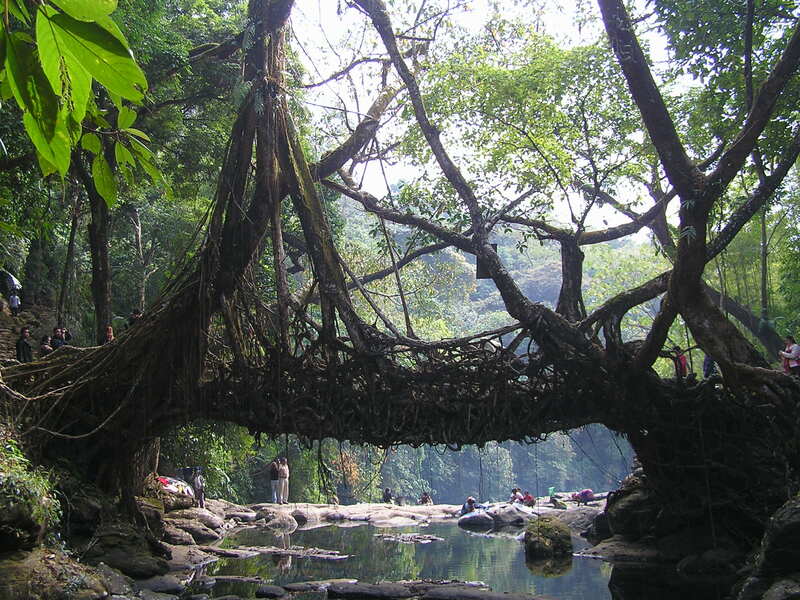 There, in one of the photographs was a double-decker living root-bridge at Cherrapunji about 60 km from Shillong, an hour’s drive. Others at the bar encouraged us to visit the root-bridges. Later that evening, while roaming the streets of Shillong market to eat noodles, soup and the delicious chicken momos at the wayside stalls we inquired for taxis for hire willing to take us around the town and to the root-bridges. A middle aged local taxi driver agreed at 800 Rs but failed to mention that he was not aware of the way to the root bridges. The next morning our taxi arrived promptly at 9 a.m and we set course for the adventure. Having driven a little away from the buzz of the city our taxi driver asked us where exactly we wanted to go. It was then that he informed us about his limited knowledge! An argument ensued but by then we were already out of the town and couldn’t get a new taxi, so we were stuck with that man. With no other option, we followed a group of local college students who seemed to be heading on the same route. We drove along the long winding road, flanked by ferns and bamboo trees on one side and deep green beautiful valley on the other side. For about two hours the road seemed to be heading nowhere. We even lost sight of the van we were following and there wasn’t another soul around. But the gorgeous greens were so breathtaking that our annoyance with the taxi driver soon evaporated. Some distance later, local children waved at us and villagers smiled…innocence and warm welcome was openly available. The simplicity of the villagers was like a breath of fresh air. Somewhere along the road we crossed a pineapple plantation. All along the hill slope there were hundreds of pineapple plants and villagers had put up makeshift shops to sell fresh produce. No where else have I eaten such sweet and fresh fruit. Finally, the taxi stopped in a village with neat huts and lanes. This village, our taxi driver assured us, was what we came looking for. Faint strains of hymns could be heard from a hut which was the church. To our surprise however, we had reached “Mawlynnong” instead of Cherrapunji or Sohra as locals call it. “Mawlynnong” village, 92 kms from Shillong is in the East Khasi Hills of Meghalaya on Indo-Bangladesh border. It is also known as “God’s own Garden” and is credited to be the cleanest village in Asia. Swathed in dense lush green foliage down in the valley was the hundred year old single root bridge known as “Jhinken Jhri”in Khasi language. 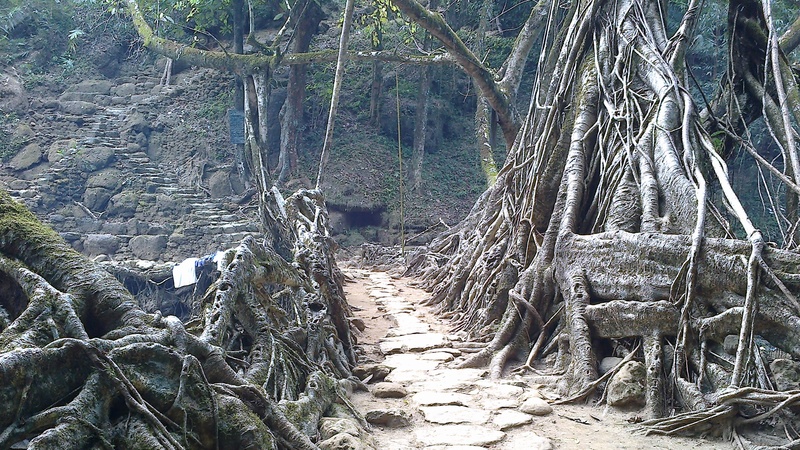 Root Bridges are made by intertwining the roots of two trees (Indian Ficus) resulting in a bridge across the stream. Being January the river was almost devoid of water but during monsoons the river is in full spate and difficult to cross. These bridges are a lifeline for the villagers who are otherwise cut off from town during heavy rains. The roots of the two trees almost like elephant’s leg, hung in midair across the stream intertwined with each other creating a sturdy pathway and the thinner younger roots grew towards the stream below. It was difficult to imagine what the village life must be during monsoon season with streams in full flow and the forest denser than ever. It took only thirty minutes to reach the valley and the trek was not as arduous. Later I came to know that the trek to double-decker root bridge at Cherrapunji takes about three hours up and down. Though I was disappointed that I missed the double-decker root bridge of Cherrapunji but the majestic single bridge was no less and actually more easily accessible. The uphill trek was relatively easy, yet I was out of steam. An old lady sat selling some citrusy fruits with sweet-sour reddish pulp. One big helping brought back my depleted energy. What we had gone looking for was the double-decker root bridge and we landed up in opposite direction…the adventure however was no less. The ingenious techniques of locals to face the strength of natural forces is not seen anywhere. A trip to these rain forests was worth of all the tiredness and cold temperatures ……..
A hill station and capital of state of Meghalaya, Shillong is blessed with lakes, manicured gardens and waterfalls nearby. 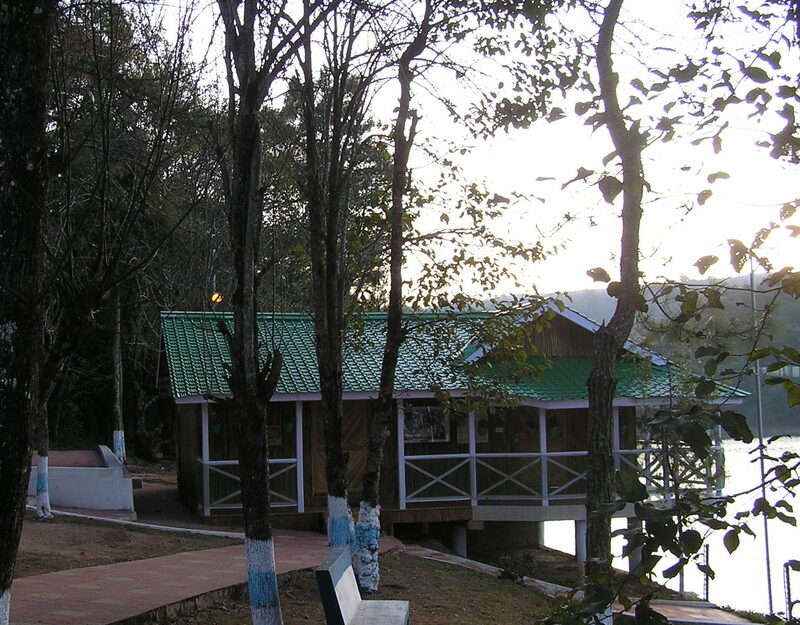 Head over to the serene and beautiful Umimam Lake for a day spent in boating, water sports or laze out during camping. Elephant falls are another attraction where few locals have also put up shops of Khasi traditional clothing. Dress up as Khasi prince or princess for memory. Go for walking trails near Ward’s Lake. Shop shop and shop in Police Baazar for shawls, jackets, rugs, silks. Binge on steamed momos, dumplings and soups with authentic flavor. Or just roam around in the beautiful town reminiscent of European era which was also referred fondly as ‘Scotland of East’. ‘Sohra’ gets heavy rainfall during monsoon. Adventurous travelers might be happy with the challenges of wet days and nights in lush greenery. I was little apprehensive to travel during monsoons. The place is cold most time of the year and its advisable to carry heavy woolens to fight the evening temperatures. The most easily available food is noodles, rice and soups but little difficult to find ‘dal-chapati’ kind of cuisine. With no rail or air connectivity, Shillong is connected via two National Highways to Agartala, Dimapur, Kolkata and Guwahati. ‘Zoom Air’ a new domestic flight operates between Jorhat and Kolkata everyday. Previous Post When Being Indian Made Me Feel Proud…. That is one amazing bridge, Shoma. I have never seen such natural creation since this day. Thank you for sharing it with us! Thanks Sony. The bridges are more than 100 yrs old. beautiful picture. Cherrapunji is one of the most beautiful place in India for sure. You are really doing a wonderful work through your blog; I just passed on “The Versatile Blogger Award” to your blog. Wow!that is very generous of you. Thanks a million….it is great morale booster. Thanks again!! That’s amazing. I’ve never seen root bridges. Thanks for the post! And its much better to look at during rains. Nature fails to surprise me with its unique , amazing and majestic formations. The root bridges is truly a fascinating wonder. Thank you. Best wishes to you and your love ones. Nature does have lots of aces to take us humans by surprise. Thanks for liking the post and Happy valentine’s day. Fascinating photos! It must be incredible to see the bridges and walk on them, and well worth the trek to get there! It’s amazing that they’ve been there more than 100 years and survived the elements of nature, especially while being regularly used by many people during that time. oh its awesome and hard to imagine….you have to see it to believe it. Amazing place, After reading this, just added in my bucket list! Yes you must. Try doing the double decker root bridge. It is example of some great skill. Thanks for refreshing the memories ! It sure was. You should plan a visit. 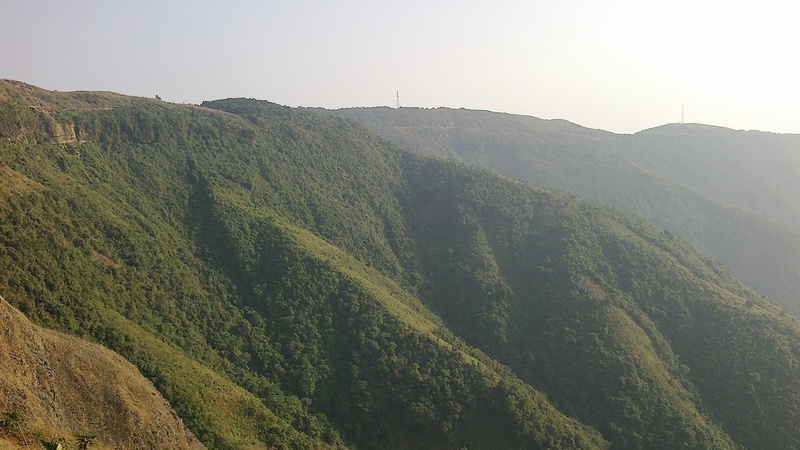 The car leaves the Siligudi plain area, and soon follows the serpentine upward road through greenery hills and Teesta river to reach the capital of Meghalaya, the Shilong, the upper part of hill. The expressions & thoughts become helpless to justify the pleasure, thrill and enjoyment we had during few events unless we ourselves present there to feel the charm and beauty of the event, and one of such events is the travelling to Shillong – i observed as i found an opportunity to visit the place two times. The life of the hill has still some smell of primitive age in spite of availability of TV, road, electricity, water, etc, if we closely observe. Things sometimes don’t turn up as we plan, and this happened with you when you reached Mawlynnong instead of Cherapoonji; but the best thing you enjoyed the place instead of repenting for the original plan. Nice to see the pics of root-bridge and read about it, how we facilitate with whatever we have – a live example. More pictures of the place are required in the article as i think because Shilong provides many picturesque spots. The stay at Air Force Holiday Cottage must have a unique and excellent feature of the visit.